Best tour guide in the Vatican and Rome? How to find one. In this post we’ll take an in-depth look at what makes a great tour guide in Rome, and how you can find a guide who will turn your visit into an unforgettable experience. I am acquainted with tour guides of exceptional quality, the crème de la crème. They have it all. Wit, passion, knowledge and are masters in captivating audiences. They are my teachers. I know guides who are, let’s say, average. They have never been properly mentored by the right people. Or, along the way they have lost their passion. Unfortunately, I also come across guides every day, who should be looking for another day job. My heart really sinks when I see bored faces, rolling eyes or hear sighs of utter exasperation from the clients. This is usually because of the guide’s incomprehensible English speech, or because he goes rambling on without any interaction with them. Luckily these guides are in the minority. What does it take to be a great guide in the Vatican and Rome? 1. Licensed. Your guide has to be officially licensed by the Province of Rome and Vatican City (Patentino di Guida Turistica della Provincia di Roma). That means that the licensed guide has passed incredibly difficult exams covering more than 3000 years of art history, including archeology. If you are not licensed, you risk having your tour being promptly terminated on the spot by the city police. Having your licence doesn’t necessarily mean you’re a great guide, but it’s a good start. 2. Passionate. What is a guide without passion? Niente. Passion is the juice of his life. He wakes up in the morning grateful and excited to have the opportunity to share his love of Beauty, Art and History. A great guide loves his job because he knows he can make a difference. 3. Entertainer. Let’s face it. Hearing entertaining stories about famous artists, popes or emperors make your tour a lot more enjoyable. If you have struck gold, your guide is also a talented impersonator of historical figures, taking you right back in time, making you feel as if you were there. When needed, he will infuse humour into the tour, and captivate you in such a way that a three-hour tour seems to be over much too soon. 4. Interactive and engaging. A guided tour is not a monologue. It’s a rich conversation between the tour guide and you. A great tour guide enlists your help to find hidden clues in an art work, to make clever deductions or to use your intuition to find the right answers. In return, you might even teach your guide something new. He will love that. 5. Responsible. A great guide understands that his work holds considerable responsibility. Exceptional artists such as Michelangelo, Bernini, Raphael and others have left behind some of the most breathtaking works of art ever made, and now it’s up to the guide to share them in the best way possible. He owes it to them. Your guide realises that your trip to Rome is a once-in-a-lifetime experience, and he will put his whole heart and soul into the tour. 6. A lover. Yes, a great guide loves people. Your guide takes care of you as if you were his own family. You’ll feel secure and protected. Your guide instantly senses if someone needs special attention and makes sure nobody in the group feels alienated. After the tour, you might even share a hug with him – it happens – and gain a new friend in Rome. 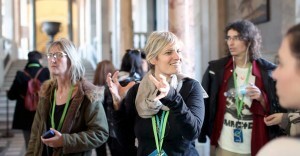 How do guides work in Rome? Guides in Rome are self-employed, work directly for their own clients, and also indirectly for local tourist agencies which organise group and private tours. Only a few guides have their own website, so they are not so easy to find. So, how do you find a great guide? The number of tours on offer in Rome is vast. How do you make a choice in a myriad of attractive offers? And how do you find a great guide in Rome? 1. Check with family, friends, neighbours and colleagues. You might be surprised how much information will come your way. Nothing is better than first-hand experience. 2. Have you booked a hotel, Bed & Breakfast or Airbnb place? If so, check in advance with the reception or owner. They usually know great guides who will not disappoint you. It’s in their own best interest to give you good advice. They might even schedule a tour for you or put you in direct contact with your guide. 3. Are you surfing the web in search of the perfect deal for a tour? Pick two agencies that seem interesting to you. Send an email with the dates of your stay in Rome, and ask them for a tour with their top guide. Most agencies have guides who get 5-star reviews and they will gladly propose them to you. If possible get their name and do a search on TripAdvisor to check their reviews. 4. You haven’t booked a tour in advance? 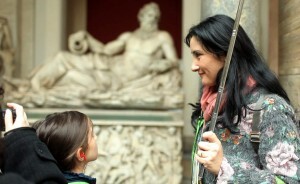 Are you tired of waiting in the long line to enter the Vatican Museums? 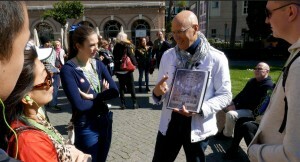 Street promoters will try to sell you a guided tour with a fast entry into the museums. Can you trust them? Mostly, yes. It all depends on the guide you get. Ask for the name of the guide, and do a quick check on TripAdvisor. Again, tell the promoter that you want to do the tour with their best guide. If needed, postpone your visit for a few hours to ensure you go into the museum with a top notch guide. It’s worth it! Golden tip: book the afternoon tour! 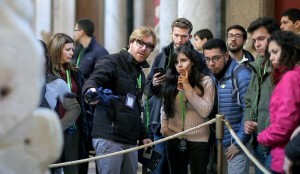 Although every Rome guide book advises you to book a tour in the Vatican or Colosseum in the early morning, the best tip I can give you is to book a tour for around 2.30 p.m. or even better, take the last tour at 3.30 p.m. You’ll be delighted to enter an almost empty museum. Being able to move faster, you’ll see more of the museum in a shorter amount of time. And you’ll be able to take awesome pictures. Don’t spread the news though, we want to keep it a secret! So, did you have a great guided tour in Rome? How did you find your guide? Thank you for sharing your experience in the comment section below. Note: In this post I have used the pronoun he when referring to a guide, following the advice of grammarians. It goes without saying that you can replace he by she. To tell you the truth, the best guides I know are of the female gender! Why you should learn Italian. Heaven or hell? How to drive in Rome. Choose a licensed guide in Rome who is also an artist!